Dr. Jody Foster is a Clinical Professor of Psychiatry and Vice Chair of Clinical Operations at the University of Pennsylvania. She is an expert in people who are disruptive and is the author of The Schmuck in My Office…How to Deal Effectively With Difficult People At Work. 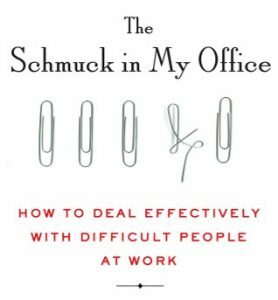 In her book, Dr. Foster talks about 10 different types of “schmucks” you might encounter around the office cooler or in the office next to yours! Narcissus – These schmucks are the entitled, self-centered, attention-seeking type with an inflated ego. The Bean Counter – This schmuck is a micromanager who is stuck in the weeds with controlling your work. The Venus Fly Trap – They are upfront and very appealing, but when they draw you in, they chew you up and spit you out. Everyone walks on eggshells with this schmuck! Why are some people so difficult to deal with? How do we handle issues with others in a professional way? How do you know when you’re working with a schmuck? Listen to our episode for more from Dr. Foster! Be self-aware. The better you know yourself and what sets you off, the better you’re going to be able to determine what behavior in another person causes you to react. Don’t judge. Remember that these people don’t set out to be disruptive. We all have personalities and we all bring them to work with us. Give them the opportunity to self-correct. It is in our best interest to point out to people when they’re being disruptive. Pull them off to the side and let them know. Don’t be afraid to have a difficult conversation. You get braver each time you have these conversations and remember that we are each responsible for 50% of our relationships. Hit the pause button. When you pause for a moment before you react, you are more in control of your emotions, and therefore more in control of the situation. Have empathy. Don’t jump to anger. Instead, get to know the person, learn about them, and find out what the underlying dynamic is that drives them to behave badly. Be thoughtful. It’s the action, not the person that is frustrating you. It feels good to take the high road so think about how you could be more thoughtful in the situation. LISTENERS: WHAT KIND OF SCHMUCKS HAVE YOU ENCOUNTERED? Send us your answer. Either leave us a voicemail at 1-646-653-9278 or send us an email. We may talk about it - or we may even talk with YOU - on the air!